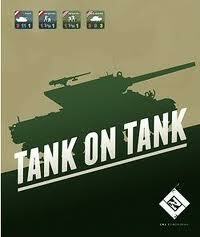 Tank on Tank , created by Lock 'N Load Publishing, is a small board game consisting of 40 playing counters, 2 8.5" x 11" game maps, a players' aid card, rule and scenario booklet, and dice. Tank on Tank depicts tactical ground combat in Europe in the latter years of World War II. It's not to scale, as it's suggested to be focused on tactics. The American units involved are Shermans, Wolverines, Priests, infantry and the anti-tank guns that fight alongside them. The German tanks consist of Panzer IVs, Tigers, WESPEs, and the infantry and their anti-tank guns. 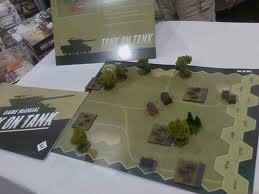 The back of the box claims Tank on Tank is a "smaller game that can be learned in less then five minutes and played during a lunch break." I found that can be true for those who have been into tactical games for a while; however, those who haven't will find this game to be a little more difficult. The terms used in the rule and scenario booklet will be familiar to those who already have the knowledge of tactical war games; Wikipedia helped me out in this regard. The gameplay itself can be completed in as little as 15 minutes depending on your level of tactical knowledge; for newer players, it could take upwards of 45 minutes. The game can be played solitary or against a friend. Playing solo does, of course, take away the aspect of having the opponent as an umpire -- which is beneficial, as your foe draws an action point value and doesn't reveal it until you have expended that many points, creating a clever fog-of-war system. The game does have its luck-based elements, such as rolling the dice for shots fired, but really, even in war they aren't all hits (and it was mostly luck). I found this game to be a little over priced for the details on the components. The maps are printed on a high-gloss thick paper and are quite flimsy; this does, however, make it easy to transport if you are using this as a quick go-to for lunch breaks at the office. The counters were of excellent sturdiness but, much like the game maps, lacking in artwork. If you like a quick tactical game, this one is a good go-to. Really, what other game do you own that you can set up in 5 minutes and play in 15? If you are looking for a scale game with factors like weather, morale, smoke, detailed terrain etc., you may want to look elsewhere, as you would be highly disappointed -- and what did you expect? I did tell you it was based on tactics! See more reviews by Dads Just know here.